Happy birthday to me! 35 years old and a new nurse! Yep it doesn't matter if you're 21 or 61, if you wanna be a nurse, DO IT NOW! I actually wanted to do this earlier (like when I was in my 20's) but things always came up. So finally I said I'm gonna do it. I quit a job I'd had for 10 years and took a $2.00 pay cut to be a CNA so that I could learn more about my future profession. Now I'm where I wanna be! 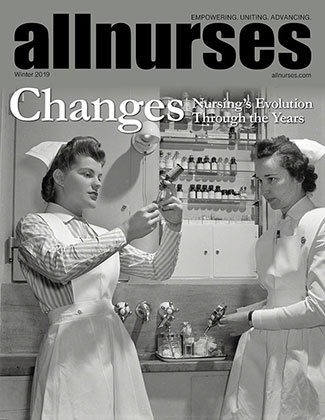 Three years ago, in 2011, when I first joined allnurses, I had a dream of becoming a nurse. I read many forums and topics and each one said the same thing. "You will be (insert age) in 2-3 years anyway. You can be (age) and be a nurse or be (age) and be just like you are now." I'm so glad I decided to go on and chase my dream. Now I'm 35 today and I have been a registered nurse since June 6th 2014!! Follow your dreams and never give up! It is worth it! The trick worked for me! Took my test June 6th. Cut off at 82 questions! Tried Pearson Vue as I was leaving the facility and got the good pop up! It works! Check with your local community college to see if they offer classes. Also nursing homes sometimes hire people and give the classes in the facility to certify them. Try calling a few and check! What is a good entry level job when changing careers? I started off as a CNA which has helped me to see and experience many different things in the medical field. Hi! I know this is a year later after your post but just wondering if you were accepted? I'm not sure if they let you know how many points you had but the way I figured mine, I should have had between 30-40 and I was accepted in Fall 2012. I'm not 100% sure about this but I have a friend who let her license lapse and it had been over a year since they expired. All she did was call the licensure place and they told her all she would have to do it retake the test, not the entire course. I would give them a call and find out your options. I was told yesterday at orientation that the reason for the Ipad is because all facilities will be electronic within the next few years if they are not already. So this allows us to be familiar with the electronic record keeping and such. Gotta stay with the times!!! Who has been accepted for fall 2012??? I got accepted into Northeast MS Community College in Booneville, MS!!! Start Fall 2012!! Can't Wait!!! CONGRATS!! I also received my acceptance letter this weekend for the Associate Degree Nursing program at Northeast CC in my state. SOOOOO happy!! I am an older (32) non traditional student so I'm hoping I can do this!! I just found out Saturday, May 26th, that I got accepted into the ADN program at my local CC. It states on the letter that an Ipad2 or Ipad3 is required and all books are to be etexts or ebooks, something like that. What skills did YOU get at the CNA state exam? I thought all states had written exam and skills exam.? Hello, are any CNA's out there? Welcome!! I am a new CNA (certified April 14th, 2012) in MS. Hoping to get into the LPN or RN program this fall. I'm 32 yrs old so this is a career change for me but I'm liking CNA work so far.